Recrystallization and grain growth are fundamental to the microstructure evolution that takes place during the annealing and thermomechanical processing of engineering materials. The 6th International Conference on Recrystallization and Grain Growth (ReX&GG 2016) is a unique conference that is fully dedicated to covering all aspects of recrystallization and grain growth in conventional and advanced materials. These include thin films, nanocrystalline materials, metals, ceramics, composites, and geological materials. Industrial applications of recrystallization and grain growth are also treated extensively. This meeting will include plenary, keynote, and invited lectures, as well as contributed presentations. 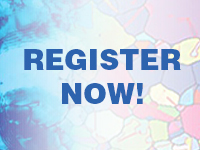 Individuals with research interests in heat treating, deformation, electron backscatter diffraction (EBSD), x-ray analysis, annealing, grain growth, recrystallization, Ostwald ripening, ultrafine grained materials, modeling and simulation of recrystallization and grain growth will benefit from attending this conference.